There's this online strategy game called Ultracorps that I used to play a lot. The original version came out in the 90's and was pretty revolutionary at the time. The game was based on an online comic called "Megabot" by Stan James and Brandon Gillam. The thing is, almost everybody was on dialup in those days, and even if you had DSL, the download times for the comic were murder, so hardly anyone read it. I did, though. 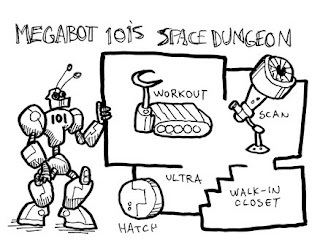 Megabot 206 was the hero of the comic. Or maybe it was Megabot 6. This dungeon is my homage to that story. You can buy prints and customizations of Megabot 101's Space Dungeon on Etsy.